ALL ORIGINAL MATERIAL COPYRIGHT 1999-2019 GAMESHOWNEWSNET.COM. All rights reserved. Seems simple, doesn't it? And relevant, to boot. A bunch of people use social media to take a quiz. Qualifiers are allowed to come to New York City to take part in a game where you could win up to $10 million dollars as long as you sit in a "Money Chair" and keep answering questions better than your challenger. A million seconds after the "show" starts, the four with the most money accumulated play a ladder format to see who gets $2 million more. 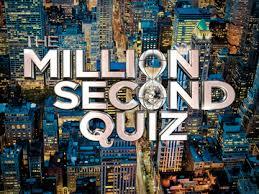 So why did NBC make "The Million Dollar Quiz" so damn COMPLICATED?! Yes, I can understand SOME of what they did during the times when the live TV cameras were rolling. But not ALL of it. They turned a novel concept into a (rhymes with "mustard truck") and, needless to say, it was derided by critics and fans alike. The "quiz" takes place on the roof of a building overlooking the Lincoln Tunnel, shaped like an hourglass. One person sits in a "Money Chair" (and I denote them as "Champion" during this review), which starts to add up money at one dollar every tenth of a second. Another person - who has been standing in a line to participate - stands at a "challenger station". The two then answer multiple-choice questions to accumulate points. They only have five seconds after all the choices have been read to them. Whoever is right (even if it's both of them) earns points. The bout lasts a set amount of time. If the Champion has more points than the challenger, they stay in the seat and await the next challenger. If the challenger has more points, they replace the Champion in the "Money Seat", starting a $0 and moving up after sitting down. If a Champion ends their run with one of the four highest amounts, they stay in "Winner's Row" until someone beats their score. All bouts outside of the live TV episodes last 500 seconds and each question is worth one point. During the aired episodes, three bouts are played. During each bout, the questions start at one point apiece and go up by one every 100 seconds. Both Champion and challenger may also, instead of answering, "double" the opponent, forcing them to answer the question for double points. A wrong answer gives the doubled points to the one who "double"d. However, the one who got "double"d can "double back", forcing the initial doubler to answer for QUADRUPLE points. The first aired bout is the "Challenger" round, which is played by the next person in line. The next is "Jump the Line", where someone who qualified using the MSQ app and doesn't HAVE to wait in line. The third is "Winner's Defense". The "Power Player" in Winner's Row - which was the one with the most money in the first EP or the one who answered the most question right during the taping from then on - chooses one of the four Winner's Row players to put their money on the line again the current Champion (even themselves, if they wish). The winner of that bout gets both the money in the Money Chair and the money the Winner's Row challenger accumulated. If it's the Winner's Row challenger, they go back into the Chair and their winnings continue to accumulate. Otherwise, the challenger leaves Winner's Row. After the million seconds expire, the four in Winner's Row then play a ladder-format tournament of bouts. Fourth-place faces third-place in a 400-second bout, the winner of that plays the second-place person for 400 seconds and the winner of THAT faces the biggest winner in a 500-second bout. The winner of that tournament gets an additional $2 million. Have to admit, the set was pretty snazzy. The large hourglass certainly added to the motif of the "quiz". And, should inclement weather attack, they could just rush inside the building and continue (that never seemed to happen when the cameras were rolling, though). The "Money Chair" looked kind of cool, too...in a "neo-90s" sort of way. Ryan Seacrest used his years on "American Idol" to good use. Almost always smiling, always keeping the show going at a good clip. And his youthful demeanor and looks didn't hurt him in the least. He looked put young and veteran-like at the same time. Oy...where to begin? Having the TV bouts with a different scoring system as the non-TV ones was not a good idea. I understand that it's relatively boring going one point at a time but even the least-experienced of hosts can make it SEEM more exciting. Heck, the clip I managed to find was of the first non-TV bout after a TV episode...and it seemed exciting to me to a point. And the "double" and "double back"...TOTALLY unnecessary. And about the "Winner's Defense": why didn't they just have that at the very end? Those in Winner's Row EARNED their places, dammit! They shouldn't be subjected having their spot usurped every night. I can understand it at the end since the person in the Money Chair probably doesn't have enough time to earn their way in the Row...but they should've done it just then or every hour or two if you want to really be consistent. And while the concept was intriguing, you have to believe that everyone on line had to have asked for two weeks off from work, just in case they made it to Winner's Row. And THAT dropped productivity in this country a bit, I'm sure. And what of those who COULDN'T get the time off?! They're best chance of being on a game show and they have to WORK during it?! Oh, and why should the Winner's Chair amount keep going up when the Champion ISN'T answering questions? He could be on the toilet for 10 minutes and earn $6000 just taking a poop. And the "TV time outs" during the episodes still kept the clock running, too. Not fair! A similar concept would work, I'm sure. But, to keep things fair, the format shouldn't change just because the camera's are on. What's more, make it $20 per second and stop the "Money Chair" when you're not in a bout. A 500-second bout means $10,000 and that should be sufficient moolah for a win. People felt it was all style and VERY little substance...and they were right. Work out the kinks and try again if you are even THINKING about a second go-round of this! Otherwise, "nice try". Chris Wolvie's would rather take a million microsecond quiz, thankyouverymuch. Follow him on Twitter @ChrisWolvie and e-mail him at chriswolvie@yahoo.com.